Greensleeves (What Child Is This?) by 00.52. Don’t forget to check out 2013’s new song, Christmas Eve Sarajevo, if if you haven’t had a chance yet. Christmas Eve Sarajevo is a rocky blend of God Rest Ye Merry Gentlemen and Carol of the Bells. Merry Christmas to all, have a great day today. There are now a total of 5 videos listed under the 2013 heading on the video gallery page. In addition to that, there are also a few more photos in the 2013 photo gallery since the last blog post. 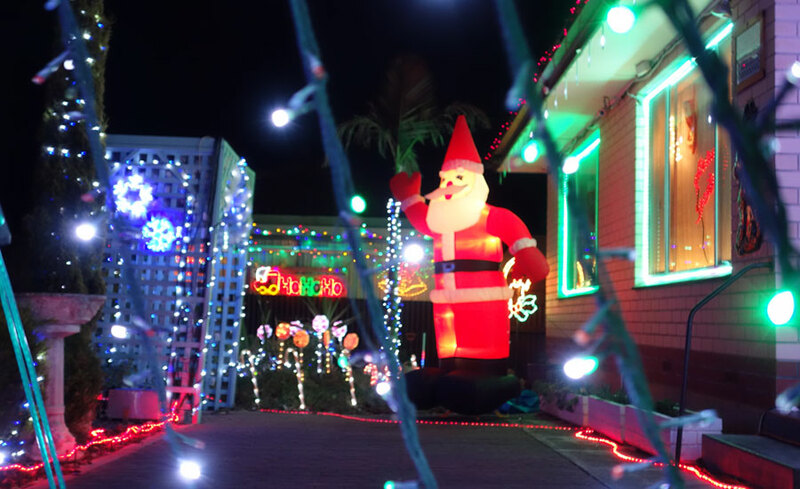 At long last, photo and video footage of Ryan’s Christmas Lights 2013 is beginning to be uploaded online for all to view. The first video to be published is Christmas Eve/Sarajevo (God Rest Ye Merry Gentlemen/Carol of the Bells) by Trans-Siberian Orchestra – a brand new sequence for 2013. At time of posting there are also a total of 5 photos available in the 2013 photo gallery. With yesterday being December 1, Ryan’s Christmas Lights is now operating for 2013, with the initial switch on happening last night. After doubts that the evening might have been wet, the weather cleared up in time that there wasn’t a problem. This year the website has received a major overhaul with a brand new more modern looking layout, powered by WordPress, a content management system. Happy New Year, another season over! It is nearly 2013 this New Years Eve, that means once again it is the end for Ryan’s Christmas Lights for the year. The tear down stage is next on the schedule, but it is never has interesting as the decorating stage in October/November. Happy New Year! Merry Christmas this 2012, enjoy the display videos! The big day has arrived, may it be filled with happiness and family fun. Just in time to go along with the festivities, the last of this year’s display videos are now online for your viewing pleasure. Whoops… we had gremlins! Now all fixed. Apologies to anyone who came past tonight, who saw a dark house! There were gremlins in the control system and due to other festive events I was not able to fix it during the show time. But now all looks set once again so the display will be back on as planned from tomorrow (Monday) at 8:30 pm. On the plus side, some videos and photos are now live on the videos and 2012 gallery respectively. More videos are coming. The 2012 season for Christmas lights has begun! There were a few spots of rain and the odd clap of thunder earlier, but the weather cleared just in time. As always, the light show running times are 8:30 to 10:30 pm throughout December.